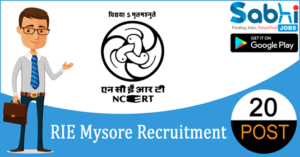 RIE Mysore recruitment 2018-19 notification has been released on official website www.riemysore.ac.in for the recruitment of 20 vacancies at Regional Institute of Education, Mysore. The candidate who is looking for Nursery School Teacher, Assistant Professor & Various vacancies can appear for walk-in-interview on 25th to 27th June 2018. Qualification Nursery School Teacher: 12th or PUC with Nursery/ Preschool Training knowledge of English and Kannada. Assistant Professor: Master’s Degree/ M.Sc/ M.Ed/ MA/ M.P.E/ M.P.Ed in concerned subject. How to Apply Interested and eligible candidates may appear for walk-in-Interview along with a set of self-attested copy of certificates with recent passport size photograph and all original documents at the time of interview. Venue of Interview: At RIE, Manasa Gangotri Opp Institute of Speach Hearing, Mysuru, Karnataka- 570006.